In previous lesson, i talked about pagination in cakephp 1.1. In this lesson, i'm going to talk about pagination search result in cakephp 1.1. (like previous method). With PaginationHelper and PaginationComponent in previous lesson, they only help conventional pagination. But, when we add search condition into request, pagination has been error. The reason is that when we implement paging of pages the variables will be transmitted via a URL in the GET method. So that the filter conditions in the form will not be passed on, and when intializing the page, it will not understand the conditions transmitted from the GET method, so paging no longer accurate. Transmit filter condition to the POST method and pagination parameter to the URL in the GET method. The first way has a big disadvatage that is if we transmit all condition via a URL, URL will very long and ugly. Simultaneous, URL only have maximum 256 character, so when we search with big data condition, the first way is impossible. So, we choose the second way : transmit filter condition to the POST method and pagination parameter to the URL in the GET method. 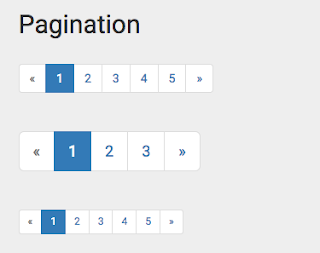 In previous lession, pagination will be perform through GET method that means links will include paging parameters. Pagination will completly base on that parameters. Note : You must set name to form is 'form', otherwise, function can't run. This function will be add to layout. It use some function of jquery. If you don't import JQuery, import it now. Good luck.